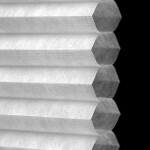 Our Honeycomb Shades are a very flexible product and great for all windows and doors. The cells themselves come in three different sizes of 3/4″, 3/8″, and 9/16″ . 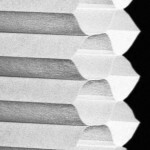 They can also be manufactured in either a single, double, or triple honeycomb and come in a variety of opacity levels. With over 50 fabrics and colors to choose from in our collection, we can match any interior or style. We can also manufacture this product with angled cuts for custom jobs. Our Honeycomb shades can fit the hardest custom shape applications.